Phoropter values were measured in 0.25 diopter steps, while VASR data was refine-able to the nearest 0.01 diopters. Final corrected visual acuity was recorded for each eye after each procedure using standard Snellen targets. The phoropter measurements were conducted by faculty members at SCO (Lievens, Newman, and Kabat), the VASR subjective measurements were conducted by an optometry student (Weber). The results revealed that there was no statistically significant difference from the mean in equivalent sphere measurements (p = 0.1383) between Vmax VASR and the phoropter. Non-parametric analyses (Wilcoxon) were performed as there was a negative skew and the data was platykurtic. Dioptric values for traditional refraction ranged from +1.13 to -12.75 (95% confidence interval = -1.63 to -3.63), with a median of -2.50. The VASR, values ranged from +1.08 to -14.39 (95% confidence interval = -1.26 to -3.46), with a median of -2.69. The spherical equivalent datasets were highly correlated (r = 0.993); cylinder power and axis were as well (Cylinder: p = 0.6377, r = 0.864) (Axis: p = 0.6991, r = 0.738). Visual acuity measurements were similar for both groups: 14% of subjects had better acuity with VASR (> 1 line Snellen), 3% of subjects had worse acuity with VASR (>1 line Snellen), and 83% had less than 1 line Snellen difference. 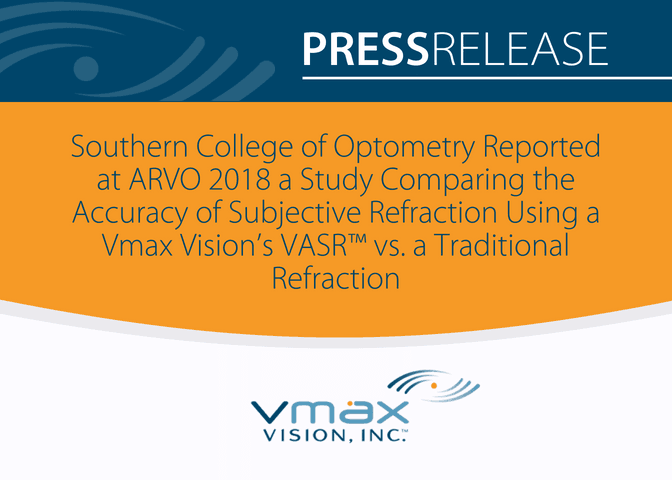 For spherocylindrical refractive error, the results obtained with the Vmax VASR by a second year optometry student with a 2 hours of training, were not statistically different from those achieved using traditional phoropter methods by a SCO optometrist and faculty member. This indicates that the training requirement to refract with the VASR is substantially easier than training to refract using a phoropter, which takes several months (or even years). The VASR (Voice Activ™ Subjective Refractor) autorefraction utilizes wavefront aberrometry and its subjective refraction uses proprietary point spread function technology. The VASR exam is voice-guided during the entire refraction and it combines artificial intelligence to optimize refraction outcomes. Other advanced features include subjective nighttime refraction, 4 minute complete auto and subjective refraction in normal sighted patients; increasing patient flow. The VASR’s small footprint of 12" by 18” reduces a refraction lane to a tabletop station. The low weight and small in size makes it ideal for portability.